An unusual view from around 1905, looking down Barrow Road from the Loughborough Road end. On the left is no 2 Barrow Road, and the opening to Farnham Street can be seen a little further down by the telegraph pole and the curved wall. On the right, is the side of 29 Loughborough Road and 1 Barrow Road (Veranda Cottage, painted white). The door which the tradesman seems to be knocking, is still there, but the extension immediately adjacent to it today, must have been built after this time. Beyond Verandah Cottage and the entrance to Castledine Street is another house which was called Church Hill Cottage. Research from looking at maps of various dates, shows that Church Hill Cottage was demolished sometime between 1922 and 1938. The handcart in the picture, appears to have the name of Adcock written on the side, which could refer to Tom Adcock, a carpenter who lived on Meeting Street. Handcarts were a very common sight in Victorian and Edwardian times. They were used by many local tradespeople and a man with a handcart was probably the equivalent to our ‘white van man’ today! 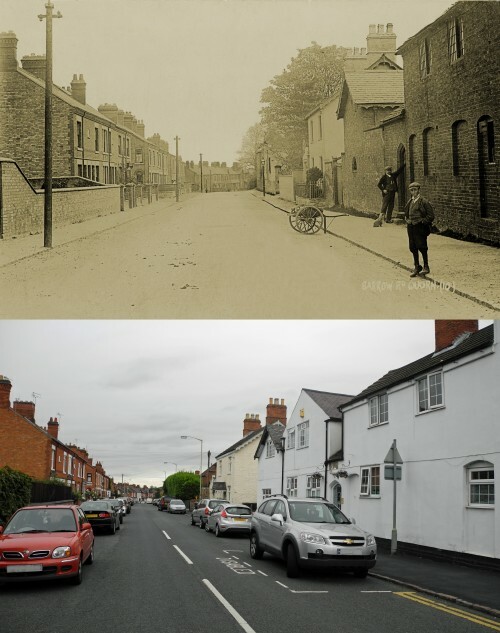 The ‘now’ photograph was taken on a weekday morning in July 2016, but Barrow Road was still full of parked cars – what would our forebears have made of the modern streetscape?